By LUDWIG VON KOOPA - Maybe I should ask Iggy to write for us sometime. He seems like the kind of Koopa to do that. When I wrote this clause yesterday, “Instead of releasing the video that will be the focus of tomorrow's article (...if it's released),” I really thought Nintendo would today release Paper Mario: Color Splash's Rescue V: Episode 4 as part of its series that we've been covering. It'd give us a view of the Yellow Coliseum and the Rescue Yellow Toad squad. Well, instead, they put out this episode of another web-series they have on their YouTube channel, the Nintendo Minute. This also covers the Yellow Coliseum, though from the perspective of that disgusting red-hatted plumber, not the (presumably virtuous) real protagonist, the yellow-hated Toads. Might as well talk about it. So, we have two important Koopas making introductions here, and Rescue Yellow. KoopaTV staff member Kamek, and one of my brothers, Prince Iggy Koopa! Hey, bro! You got a Chain Chomp chariot! 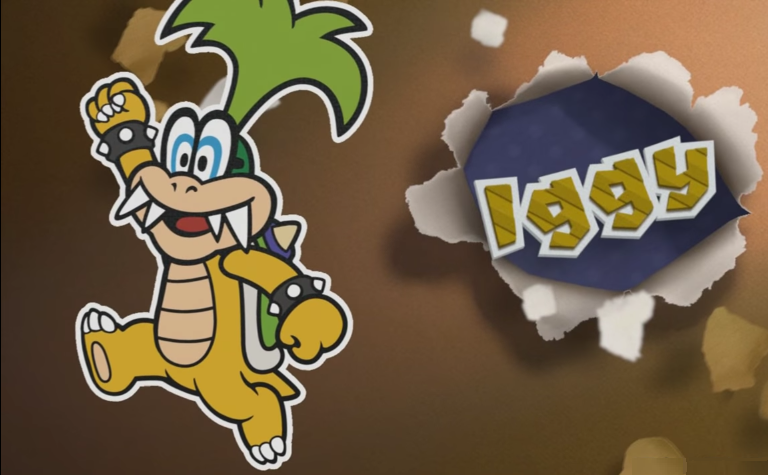 Have you noticed that Iggy Koopa has really been a fan of raising and siccing Chain Chomps on people, particularly Mario? Well, he's back with a Chain Chomp chariot for him and his minions in this boss fight! As I pointed out when Intelligent Systems saw fit for me to have a warship due to my Team Pirate affinity in Rescue V Episode 3, they really are keeping everyone except Morton in-character so far. ...Morton's not like that, I swear. Hey, it's everyone in this article besides Rescue Yellow! ...That's what he gets for delaying his episode without explanation. Unlike Morton, Iggy actually gets some flattering, good dialogue. That gives me hope for myself. Kamek doesn't have any dialogue, and we actually don't know what he's doing in Paper Mario: Color Splash. Much like his membership as a KoopaTV staff member, it seems he makes few-and-far-between, unplanned appearances to cause some kind of trouble. Kamek is against Nice! things, so he's just going to swoop in real quick and change the background music to his Paper Mario: Sticker Star theme. 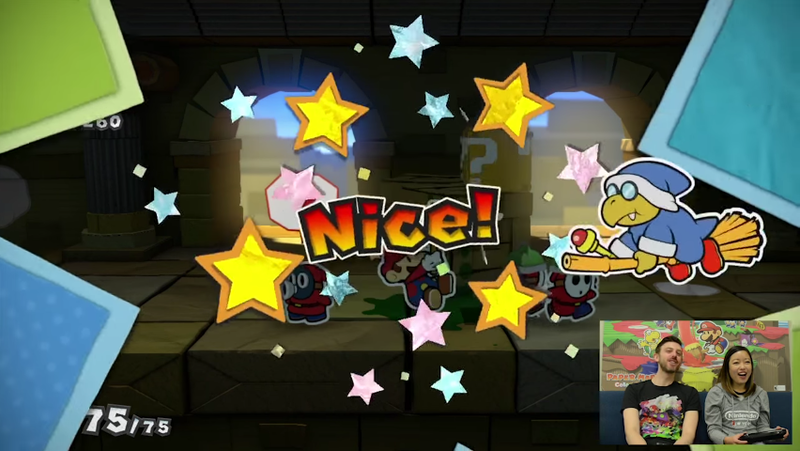 Kamek is referring to the Spike Helmets that the enemy Shy Guys were wearing. I'd like to note that those are a common fashion accessory. 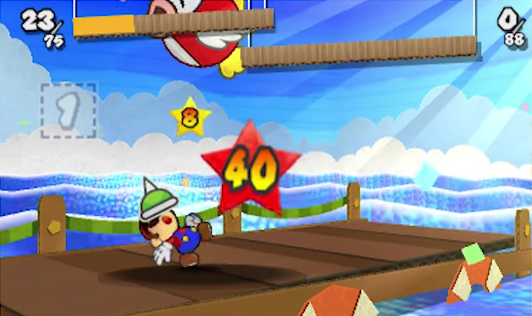 Here's Mario trying to wear one in Paper Mario: Sticker Star. I don't think that's how you're supposed to wear it. Kamek then stated that it's apparently normal for Japan-related things to have poop look like that, citing the case of the Digimon Numemon. Numemon is made out of poop. Kamek is a wise Koopa, so I'll take his word for it. 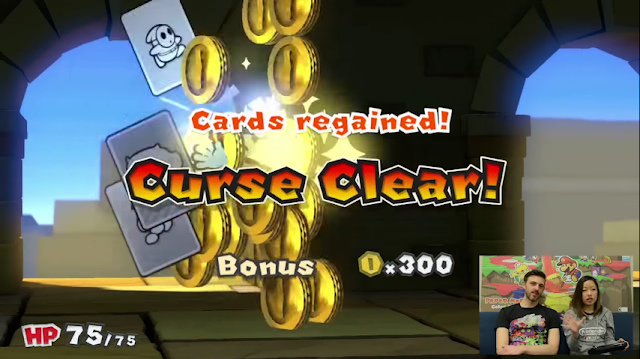 Personally, I prefer when Mario is cursed and he loses his cards. 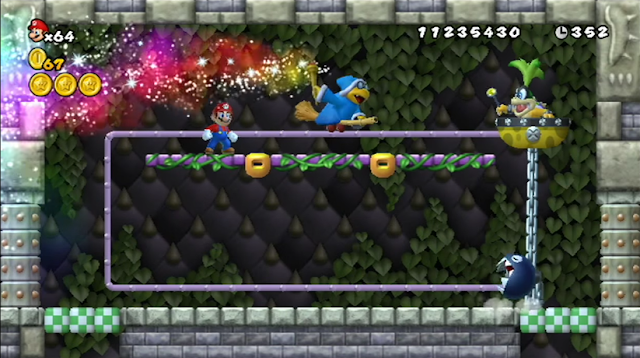 Meanwhile, it appears that the Rescue Yellow squad stole a big bone from Marmalade Valley, and gave it to the plumber. Sounds like... dubious protagonism, if you ask me. Side with the real protagonists, like Kamek, Iggy, and myself; not bone-stealing, bone-squeezing, bone-seeking bad guys like Mario. ...And Rescue Yellow. Paper Mario: Color Splash continues to impress KoopaTV's staff with its attention to detail. If Nintendo releases Rescue V: Episode 4, KoopaTV may or may not cover it, depending on if it is substantively different than what was talked about in this article. What do you feel about the accurate portrayal of KoopaTV's staff members and affiliates so far? Do you still believe Paper Mario: Color Splash is a terrible disgrace? Rescue V Episode 4 is at last released, but there is a far more important character revealed around the same time to talk about. Iggy Koopa being able to have a pet Chomp is governed by strict laws in Koopa Kingdom. "Remember, Nintendo Minute is never a minute!" As someone who doesn't often watch Nintendo Minute, I clicked the video expecting it to be a minute long, then saw it wasn't, and only then saw your comment. Speaking of Kamek, do you think Kammy Koopa will ever exist in a game again? ...Yeah, that quote is from them. Uhh... More than a sticker in Super Smash Bros. Brawl? You didn't hear this from me, but she's dead. I know that now. ...You can tell how much I watch Nintendo Minute. Now we know there are at least two competent Koopalings in this game. Hopefully, Roy, Wendy, Larry, and Lemmy can be added to the list. I just wonder how the rest of 'em would be distributed. "Talos the Mighty! Talos the unerring! Talos the unassailable! To you we give Praise! We are but maggots writhing in the filth of our own corruption! While you have ascended from the dung of mortality, and now walk among the stars! But you were once man! Aye! And as man you said, 'Let me show you the power of Talos, Stormcrown, born of the North, where my breath is long winter. I breathe now in royalty and reshape this land which is mine. I do this for you, Red Legions, for I love you.' Aye, love! Love! Even as man, great Talos cherished us. For he saw in us, in each of us, the future of Skyrim! The future of Tamriel! And there it is, friends! The ugly truth! We are the children of man! Talos is the true god of man! Ascended from flesh, to rule the realm of spirit! The very idea is inconceivable to our Elven overlords! Sharing the heavens with us? With man? Ha! They can barely tolerate our presence on earth! Today, they take away your faith. But what of tomorrow? What then? Do the elves take your homes? Your businesses? Your children? Your very lives? And what does the Empire do? Nothing! Nay, worse than nothing! The Imperial machine enforces the will of the Thalmor! Against its own people! So rise up! Rise up, children of the Empire! Rise up, Stormcloaks! Embrace the word of mighty Talos, he who is both man and Divine! For we are the children of man! And we shall inherit the heavens and earth! And we, not the Elves or their toadies, will rule Skyrim! Forever!" I agree with anonymous, hail Talos. What does this have to do with Iggy or Kamek or Rescue Yellow or anything? Now I'm going to be completely honest with you. I didn't read the article at all. But, you should give me another guest article. I mean, you're not getting Truth points for admitting you're spamming my site. I don't "give" you guest articles. That makes it sound like I ghost-write for you. Read up about 3 comments. Guest articles must be original. For more information, please read KoopaTV's dedicated guest posts page. I should know these things, as I wrote the #1 KoopaTV article. You should, but you apparently don't. Now, please read this article so you might get some KoopaTV Loyalty Rewards Program with your comments. ...Yeah, read this one. It doesn't smell so much like filler. No, because this is one of your weird roleplay articles. But those are the best articles on the site. ...Which have been lacking in numbers lately. You might find those to be the best article topics but they're far from the best articles. Could you provide an example then? All of your articles are bad. If it has Zelda in it, it becomes /slightly/ readable. I asked for an example. ...also, why are you on this site if that's how you feel? I mean express my feelings. Your trolling would be more effective if you trolled based on article content, rather than spamming. Trolling doesn't follow a guideline sir. Trolling follows a definition, and it's different than spam. Hey, I have that same Splatoon shirt. I am not sure if I can still fit in it though. Nintendo should make maternity shirts. I mean they made official baby clothes, now think of the mothers who have to carry them. I was wondering wot the heck you were talking about, then saw Kit's shirt in the Nintendo Minute thumbnail. Would that, uh, wot's the difference between a maternity shirt and... a larger-sized shirt? I still started off underweight and small frame. So a larger sized shirt may have sleeves way too big for me while a right-sized maternity shirt takes into account smaller women who just happens to have larger bellies but the sleeves are still small. I can tell you my arms are still as thin as before. Are bigger sleeves really a problem? Floppyness is fun! I plan to commission someone to draw me Ridley with the phrase saying "Bigger Than Ridley" on it and then I would put that image on a create your own maternity shirt at Zazzle. They will never officially sell those. Too many feminists without a sense of humour will get angry about the whole "negative body image" aspect and rant against Nintendo and the shirt company which asked for the license of Ridley. I don't consider myself like most women and don't really focus much on my body as an aesthetic. I do get annoyed when they ask of I am anorexic, if I eat, "parent" me into eating, etc. I do care about my health and how people perceive it though and hate when people think I have an eating disorder. My baby bump might actually help stop some of that though. ...So how much would that commission rate be? Do feminists already rant against existing maternity shirt manufacturers? Not talking about the actual shirts themselves but the text or images that may be on said shirts. Calling a pregnant woman "big" may be considered offensive. I do say I am getting bigger though so i really do not care much about it. Going to be 13.50 for the drawing itself. Zazzle is separate from the commissioner though. Hey, you should be allowed to make light of yourself if you want to. Is Ridley gonna be, like, chibi? I have no idea. I said it probably will be more desirable to cutesify Ridley just because of what the shirt is about but the commissioned can keep Ridley realistic if they want to. Your baby's gonna be lookin' at it afterwards, so it should be cute. Paper Mario: Color Splash — Episode 5: Illusion!